Date of introduction: 1981 Display technology: n.a. Size: 10" x 14.5" x 1.6"
Shortly after the introduction of the Speak & Spell line Texas Instruments introduced with the Touch & Tell a novel product idea with their speech synthesizer technology. You place one of different pictures onto a position sensitive keyboard and start the game. Touch & Tell will ask you a random question and you point the solution with your fingertip on the picture. To keep the youngsters interested, musical tones and special sound effects appear. This educational toy was rated by Texas Instruments for childrens aged between 2 and 5 years. Do you know Qubais Reed Ghazala ? Get more tunes from your Touch & Tell with circuit-bending. The same housing and technology was used for a medical aid, the Vocaid for the mute peoples. A more advanced game was introduced with the Touch & Discover and a similar idea realized without any keyboard with the Voyager game. 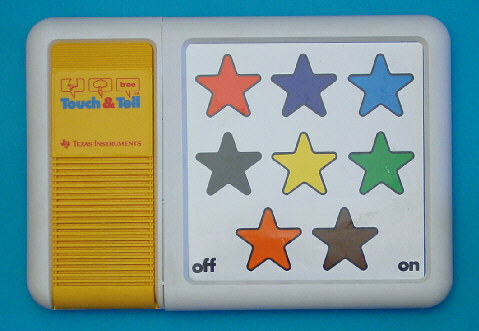 Few years later Texas Instruments introduced the Super Speak & Read game with two position sensitive keyboards and the smaller Teddy Touch & Tell. Alphabet Fun Helps children learn to identify letters of the alphabet and objects that begin with those letters. Also demonstrates the differences between small and capital letters. Animal Friends Lions really roar and turkeys go gobble-gobble as your children learns the names and "voices" of farm animals, wild animals and baby animals like kittens, puppies, piglets and lambs. All About Me Adds important words to young vocabularies by teaching the identification of articles of clothing, several types of toys, and parts of the body such as eye, ear and nose. Number Fun Teaches the recognition of numbers up to 30 - and the concept of quantity for numbers from 1 to 8. Helps build a vocabulary capable of distinguishing between "two cats" and "four cats". Little Creatures Develops greater knowledge of nature by introducing the names of small animals and their "houses" - in parks, woods and oceans. Teaches such associations as nest/bird and hive/bee. World of Transportation The fire truck's siren and rocket's rattling roar invite an exploration of methods of transportation - by land, sea, air and space - from motorcycles to message-sending satellites. E.T. Introduces character recognition and simple object identification. Recall and comprehension of key events from the movie are encouraged. The Touch & Tell is featured in the Texas Instruments Incorporated leaflet Follow the Learning Path™ dated 1991.